Using three different computers 1 Win 7, 2 Win 10 and one android phone. On the Windows 7 machine I cannot reach one web site (SanduskyRotaryPizzaChallenge.com), I get 503 server unavailable. All other web sites work fine on the Win 7 machine. Using Chrome, IE and Edge. On the Win 10 and Android the web site works fine. Only the one web site on only the one computer does it not work. I can using FileZilla I can FTP into the site, on ALL computers. So what should I be looking at on the Win 7 machine? Remember all other sites work fine. Thank you, you can remove these logs. You need to delete this entry. 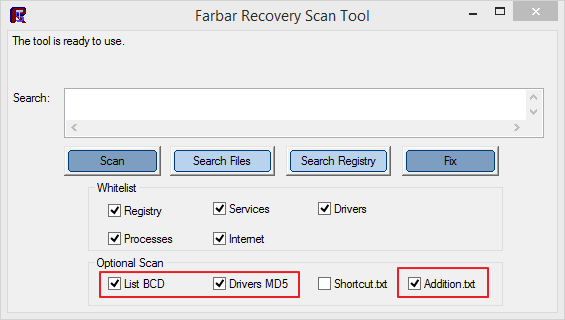 - Download Farbar Recovery Scan Tool and save it on the desktop. Run the program by double-clicking. When the program starts, click Yes to agree with a warning. Ensure that Optional Scan is checked "List BCD" , "Driver MD5" and"Addition.txt". It will make a log (FRST.txt) in the same directory the tool is run. The tool will also make a log named (Addition.txt). Please attach it in the following message as a link to downloading from the file storage (e.g. onedrive).